It has been my distinct pleasure to enjoy tea with Vardarsuyu on more than one occasion and while I would not be so uncouth as to assert any degree of friendship, we have enjoyed heartfelt laughs and serious discussion regarding the state of carpetry. It is through these experiences with him that today I choose to publish an open letter from Vardarsuyu regarding the state of carpetry (and the sales thereof) in Turkey and indeed by extension the world. His is a perspective different from my own, distinct from more normalized contemporaneous Western thought, perhaps counter to the seemingly ubiquitous labourer exploitive practices of this, and previous, eras. That being said, while it is that my perspective may differ, I agree wholeheartedly with Vardarsuyu that it is not enough to simply look at rug producing countries as suppliers, but rather instead as genuine partners. 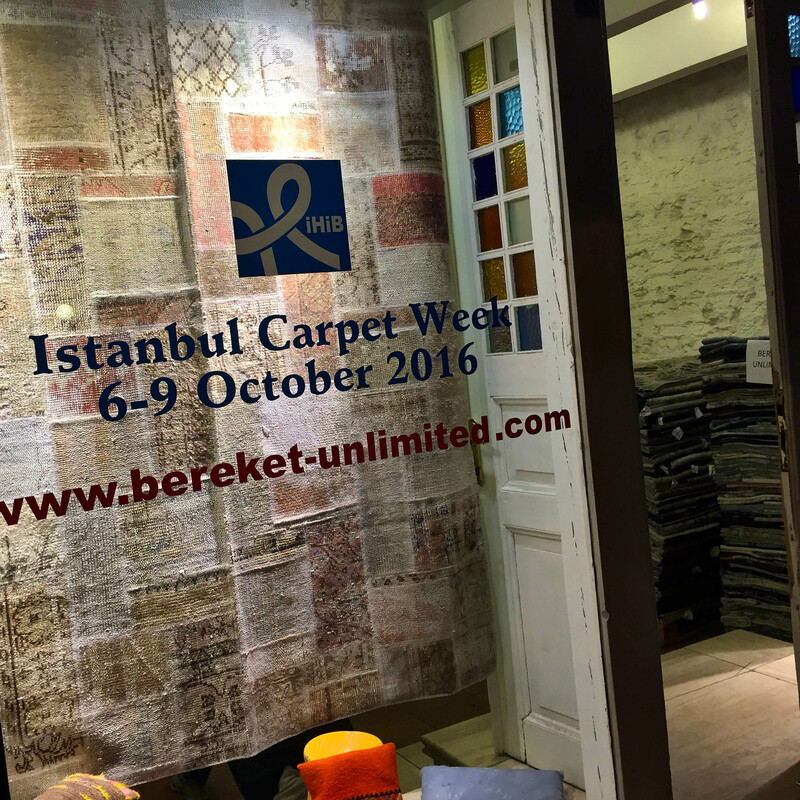 The window display of Bereket Unlimited in Istanbul, Turkey as it appeared in the Autumn of 2016 during Istanbul Carpet Week. | Image by The Ruggist. If we dissect Turkey today and look at what is happening in terms of rugs and carpets, the foremost thing we see is the preponderance of machine-made rugs from Gaziantep, a city in Southeastern Anatolia, Turkey easily reached from Istanbul via several direct flights per day. It is now the world’s number one in sales, quality, and innovation in machine-made rugs due to Gaziantep’s brave entrepreneurs working with the world’s leading designers and of course with the employees in the sector to truly convert most of the houses in the world into homes. Turkey has eighty-one (81) major cities and in all them there are of course a couple of people – pickers if you will – working with handweavings. Overall there are hundreds of thousands of people who are busy with vintage, antique, and historical handweavings which probably makes vintage and antique handweavings the second largest occupation in rugs in Turkey. These pickers in eighty-one (81) major cities, they exchange the handweavings, antiques and historical weavings with modern rugs and the exchanged pieces are then first injected into the Sultanhani and Malatya markets, before traveling onward to Istanbul – a forwarders market. From there these handweavings are distributed through good entrepreneurs of the world starting from A+ class consumers to every other level of consumer. These vintage textiles come to Istanbul mostly from the towns of Konya and surroundings with Sultanhani as a magical point and from Malatya – a second magical point – and surroundings with Akhisar, Izmir, Ankara, and Kayseri as ancillary towns. All of these towns supply the sellers to be found mostly on Etsy. Taking into consideration that on Etsy there are 4000-5000 sellers of rugs and pillows from Turkey, one can easily understand what a huge potential there is in Turkey for young doers. Additionally, throughout the world over, 24 hours a day thousands of pickers are sourcing – scavenging even – rugs from every junkyard, rug store, antique store, from sons and daughters of the collectors, auction houses, and bankrupted business in the European Union, United States, South American and other parts of the world. Daily thousands of these rugs – mostly room size – fly directly to Sultanhani mostly, with the balance to Istanbul and other centres to be washed and if necessary stripped and restored; in other words they are renovated accordingly to conform to the desired form as required by consumers who are now thirty to fifty (30-50) years old in the Western world. A huge expertise, a great wisdom. God bless the soul of late sheikh Hasan Sari who planted this seed fifty (50) years ago in Sultanhani for now the world is covered with this plant [in the form of beautifully rejuvenated carpets]. This is a huge commercial potential. And beside the brave entrepreneurial spirit of machine-made makers and the resourcefulness of carpet renovators, there exists a third component of the rug sector in Turkey: newly handwovens. The Tulus which are woven by the Sultanhani people in areas such as Demirci and Gordes, and the ones woven with vintage materials in various areas such as Kipiklar, Köyü, Çelimler Köyü, and Ivrindi. The vintage material weavings, I don’t think they have any functional or commercial importance but other Tulus which are woven by Sultanhani restorers, I think they will be samples of the Islamic art of this century. And Oushak weavings which were started by the United States’ company Aga John and Turkish dealer Asgar Sefizadegan, maybe twenty to twenty-five (20-25) years ago. Oushaks have always been woven of course, but in this case two (2) companies came together to make the Oushak weave and to make the requested look with the finishing knowledge of the restorers of Sultanhani. And this miracle happened: the new Oushaks are more decorative than the 19th century ones thanks to both companies, thanks to the restorers of Sultanhani. Today Oushaks, tomorrow these restorers can do whatever finishing is needed. It is just a matter of tapping into the potential, inserting new forms into Sultanhani. What a great opportunity for Turkey. We, that is Bereket, as a group of three, four, five people are weaving a few Tulus and we wash and try to sell a few rugs annually and we make a lot of pillows and floor cushions as well. Of course, from the years before, although we have since sold most of them, we still have several thousand carpets reloaded in our hand; we will be thankful if someone can use these. And we still have a lot of hemp, linen, cotton, and woollen textiles from which we used to do patchwork though we are not doing those anymore and we will even be more thankful if someone can find a use for these. In Turkey there is passion, there is experience, there is interior design knowledge and there is glory. In our stand [at The Rug Show] one can find these four traits as well. There is no logic in making all this expense and bringing these rugs to the United States to make money; except one logic. If you see any light with us, we are ready to be not a supplier but a partner with you. Or we are ready to open our establishment and work in congruence with you in the United States. Or if you have any other idea let us know, [we are willing to listen]. Obviously this is not just an essay on carpetry in contemporaneous Turkey as it appeared in Bereket’s booth at a trade show specifically intended to sell rugs and carpets. But that alone should not warrant discounting the messages contained therein as mere corporate propaganda for we are educated people capable of discerning more than one nuanced message – or at least we should be. Vardarsuyu speaks of three (3) branches of the rug industry in Turkey, each with their own characteristics and opportunities for advancement. As such, for doers, young doers if we apply a lens of age, there remain ample opportunities for success. I believe that for this success to be sustaining and enduring, it must adhere to one of the key maxim’s of Vardarsuyu’s writing summarized succinctly by the english idiom: it takes two to tango. Makers of rugs, Turkish or otherwise, and Western, or especially otherwise, purveyors must move past antiquated and exploitive arrangements toward those more akin to true partnership, for in truth neither party can exist without the other. Perhaps more enlightened doers and their prospective business partners will heed this message of coöperation and – as Vardarsuyu speaks of the late sheikh Hasan Sari once doing – plant the seeds that will benefit not only themselves and their partners but also future generations of the same. Disclaimer: Vardarsuyu’s letter was published without fact checking. Disclosure: I own two (1) decorative and one (1) novelty pillow as well as one (1) assemblage rug made by Bereket.